Dromantine Retreat and Conference Centre hosted a North-South Ministerial Council meeting on 3rd March 2010. These meetings, part of the Good Friday Agreement, are usually held twice a year and are hosted at different venues in the two jurisdictions. As it concerned the Transport sector the attendance included Mr Conor Murphy MP MLA, Minister for Regional Development and Mr Edwin Poots MLA, Minister for the Environment (Northern Ireland Executive) and Mr Noel Dempsey TD, Minister for Transport, (Irish Government). They were accompanied by their officials and advisors. The meeting was chaired by Mr Murphy. 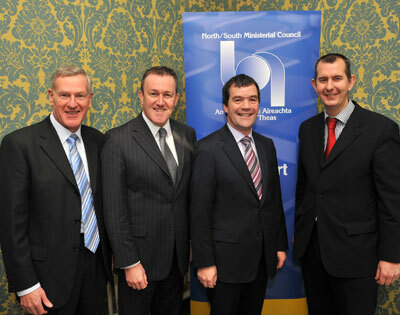 Our picture shows, from left, Father Des Corrigan SMA, Conor Murphy MP and MLA, Noel Dempsey TD and Edwin Poots MLA. Before the actual meeting, Ministers Dempsey and Murphy launched a new policy on cross-border data sharing arrangements. This will facilitate the exchange of information on vehicles and drivers, particularly relating to driving and parking offences as well as toll charges. Before the venue was decided on, officials from the North-South Joint Secretariat, which is based in Armagh, came to look at Dromantine and the facilities it could offer. After discussing their requirements etc it was agreed that Dromantine could host such a meeting. The meeting and the launch attracted considerable media presence, including BBC, UTV and RTE. All of these covered the events on their evening news programmes as did many newspapers. Such a meeting taking place in Dromantine was a new development and an experience which was welcomed and appreciated by all concerned.